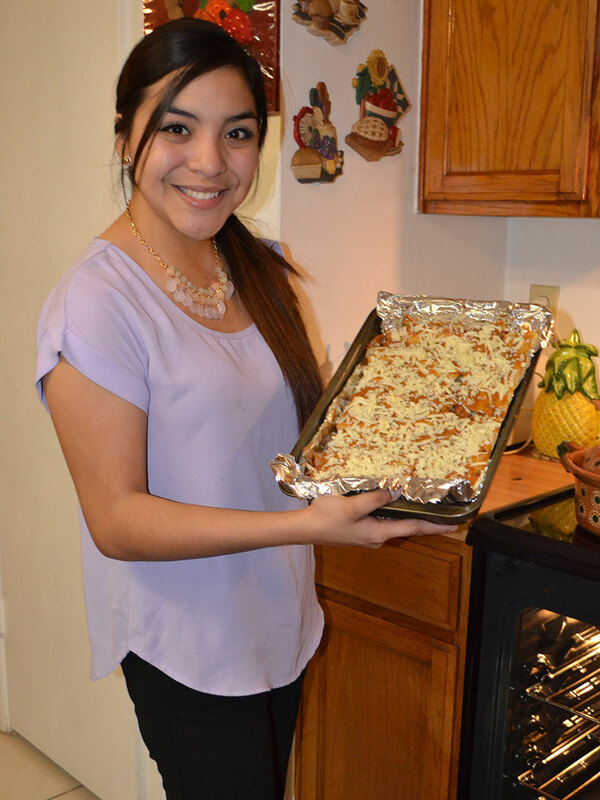 Janet Frias, a junior English-communication arts major, shares a taste of home by preparing a family favorite recipe for enchiladas. While she was growing up, her family always served this dish for special occasions. Preheat oven to 350°F. Set the stove to medium, to heat up oil. In a bowl, grate the monterey jack cheese, save for later. Pour the chili in a separate bowl, also set aside for later. In the hot oil, dip each tortillas for about 5 seconds. Set these aside on a plate. Line the pan with foil. In each tortilla place chili, then top with cheese. Roll up the tortillas that have the mixture and place them in the pan. Once they are all laying in the pan, add more chili over the tortillas. Continue to add cheese over the chili to your taste. Bake in the preheated oven for 10-15 minutes. Recipe makes about 6 servings.